Mian Car Ac is one of the leading providers of Ac parts in all of Pakistan. It is one of the most experienced and reputed companies in the league and has a solid reputation of providing quality AC parts for years in Pakistan at the most optimistic rates. Mian Ac is one of the largest organizations in the AC business that are dealing with the supply of Car Ac parts in Pakistan.It is the widest provider to all Ac related car products in the market and is currently fulfilling the demand of one of the largest customer bases in Pakistan. Mian Ac offers both dashboards mounted and roof mounted cooling units. These units not only control the humidity and temperature at the desired levels but they also filter the air. They have a high power efficient rating and they have low operating noise. Mian AC offers a diverse and varied range of car evaporators which come in different types and sizes. We offer both aluminum and serpentine time evaporators. 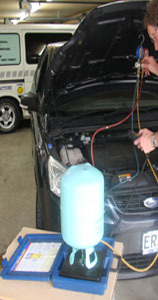 We are offering special evaporators which are one of the main features of all modern day cars. Mian Ac also offers high quality receiver drier with the total ac unit. The receiver drier, though a passive part is also important in the working of the whole unit and Mian AC distinguishes itself from others by offering strong receivers to avoid leakage of gas. Last but definitely not the least; the expansion valve is the part which delivers the working of the whole unit. Mian Ac keeps this thing in mind as they provide to you high quality expansion values which give excellent results in all conditions. Mian car Ac is committed to allow only the highest quality of products to enter the market and hence it condemns all low quality products and continually improves its Quality Management Structure to provide the highest quality products to market users. Mian Ac believes in providing a better world to live in to the future generations hence it is fully committed to sustaining earth’s environment. It strives to maintain its environment friendly approach by providing only the products that satisfy the international environment policy. It only supports non CFC products. Mian Car Ac is proud as a supplier of Ac products of its talented and enthusiastic team. Our members comprise of talented individuals from all over the country and are continually providing employment to talented and deserving individual. We believe is equal opportunities from individuals all over the world and the only distinction is skill and qualification. Powered By Zartash.com All rights reserved.